This web site is dedicated to the forthcoming International Dressage Competition*** of Nice - Winter 2019 . It will provide you the most complete information about this event which will take place February 21st to 24th 2019 within the Horse Riding Club of Nice . 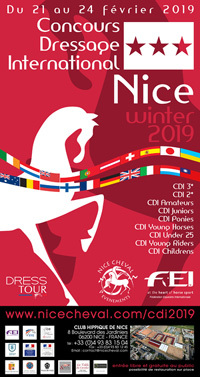 The Horse Riding Club of Nice has been approved by the FEI (International Equestrian Federation) to conduct three "3 stars level" International Dressage Competitions (CDI*** Winter 2019 + CDI*** Summer 2019 + CDI*** Autumn 2019). Those international meetings concretise the ambition for the Equestrian Club of Nice to stand as a new venue for high level competition. February 21st to 24th 2019, 37 top level tests including “Grand Prix”, “Grand Prix Special” and the most appreciated one, the “Musical Freestyle” tests. Three days of international competition with 37 tests that will distinguish competitors in this 3 & 2 stars level contest open to “Seniors 3* (Big Tour)”, “Seniors 2* (Small & Medium Tour)”, “Ponies”, “Juniors", "Young Riders”, "U25", “5-6-7 year old Young horses”, "Childrens" and "Amateur B (Small & Medium Tour)" riders. Dressage is first off the dicipline in which humans would teach a horse how to respond (foward, stop, trun...) to any of his demands (voice, body mouvements, legs, spours...). The dressage is an Olympic equestrian sport. It is often considered as the parent discipline to other equestrian disciplines. In fact, no other discipline is possible without a prior dressage to a horse. Dressage is an art as the esthetic movement takes a prominent place, and principles such as lightness, relaxation, impulse and love are essential to the achievement of "the beautiful horseback riding " to reach the level of art. This is the stylized representation of the graceful movements of the horse. The couple move on a rectangular field 60 m by 20 m (66x197 ft) and perform a series of figures belonging to a program called "tests". This program can be imposed, or freestyle with music. The free program is also called "Kür" or "Musical freestyle" (in french "RLM" : Reprise Libre en Musique). The rider uses orders as discreet as possible so as to seem almost telepathically communicate with his mount. Paradoxically, in the eyes of an unexperimented public, a performance gives the impression that the subject is easy. However, a good "test" in that competition is the result of years of intense work. The jury, composed of two to five judges evaluates the ease and fluidity in the movements of the couple. Each figure is scored from zero (figure not executed) to ten (excellent performance). The jury also allocate notes together to judge a number of parameters, depending on the technical level of the test, such as the precision of the execution, submission of the horse, the quality of gaits, lead, the position of the rider, etc.. An artistic note is allocated the Music Freestyle test: it takes particular account of the harmony of the test, the choreography and the music. The total score is expressed as a percentage. An average of 65 to 70% is a good mark in national competition. In international competitions, the biggest races are won between 75 and 80%, but riders can exceed 80% in some tests. The record for a "Musical freestyle test " is 90.70%. It was established 2010 by Edward Gal riding Moorlands Totilas with the European Championship in Windsor (UK). before the start of the event!!! 10:00am : CDI3*-BT - Grand Prix Consol. 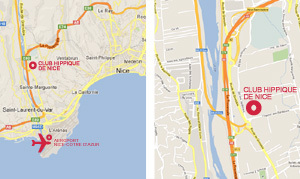 EVENTS: SATURDAY, THE 6TH OF OCTOBER 2019 "NICE for BIARRITZ"
DRAFT SCHEDULE (updated 05/02/2019). The official draft schedule for this competition is downloadable on our server (This document has been approved by the FEI). To download it : click here (PDF 200Ko) .